China has established itself as the world's largest producer of construction machines, agricultural machines and industrial trucks since the global financial crisis. This development will change the global industry landscape in these sectors permanently. In 2010, China has been the world's largest producer of mobile equipment for the first time. Depending on the industry, the production of construction machines, agricultural machines and industrial trucks grew at rates between 20 and 30% year during the period from 2001 to 2010. The demand for construction machinery in China was massively stimulated by a EUR 442 billion infrastructure program since the end of 2008. 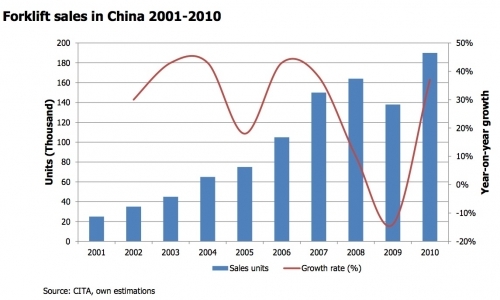 In 2009, construction machinery sales in China grew by 18.5%, while the global demand slumped by 24%. It was not until 2010 however, when the majority of the initiated infrastructure projects entered their critical phase, which increased the demand for construction equipment even more and led to a production of 500,000 units with a value of about EUR 41.4 billion during this period. 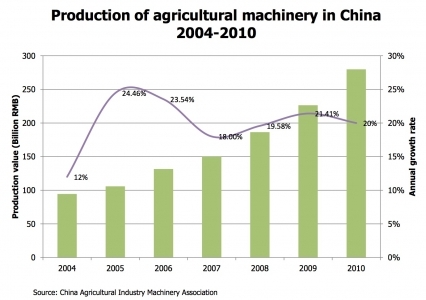 There is an enormous backlog in the agricultural machinery industry – both in terms of the degree of industry development, as well as the mechanization rate of the domestic agricultural sector. The rapid development into a modern industrial society is driving food prices and forces the country to a rapid modernization of its agriculture. The Chinese government is trying to address this challenge through massive subsidies: In 2010, about EUR 1.5 billion were poured in subsidies for the purchase of agricultural machinery, alone. Over 90% of tractor sales were subsidized, sometimes with up to 75% of the purchase price. According to our research, there were more than 600,000 4-wheel tractors, 165,000 combines and other self-propelled harvesting machines, as well as 15,000 self-propelled rice growers produced in China in 2010. The production of industrial trucks has been closely correlated to the overall economic development. However, it has been further stimulated by government initiatives since early 2009. In 2010, there were 275,000 forklifts and warehouse trucks produced in China, of which a significant proportion of around 30% were exported. Of the three industries we analyzed, construction machinery is the most developed. We identified 65 relevant equipment manufacturers, which maintain production facilities in China, among them 18 foreign companies. Of the Chinese manufacturers, there are eight among the top global 50, three of them even among the global top 10. Companies, which were unknown outside China a decade ago, are posing more and more a challenge towards the established top dogs. 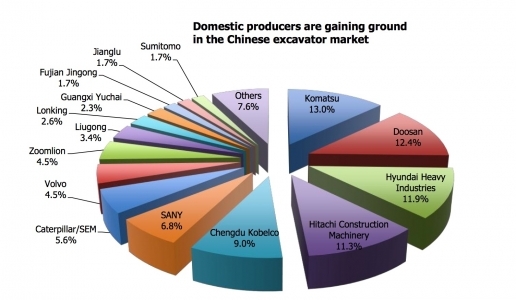 While foreign manufacturers were still responsible for 70% of the Chinese excavator production in 2008, their share had dropped to just over 50% until 2010. The largest growth could be seen in mobile and crawler cranes, concrete pumps as well as soil compaction and road building equipment, recently. In the area of agricultural machinery, we identified 57 relevant manufacturers of tractors, self-propelled harvesters and rice growers, the majority of them with technology on a very basic level. There are 12 foreign manufacturers of agricultural machines, which are maintaining or building up production facilities in China. 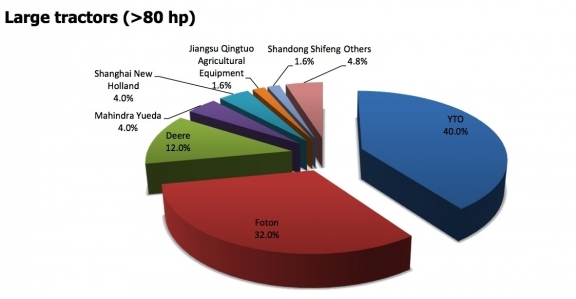 The markets for tractors and harvesting machines are dominated by the two leading Chinese companies in this segment, YTO and Foton Lovol, followed by the major international manufacturers. The segment of self-propelled rice planters is largely in the hands of Japanese and Korean companies, but also here, Chinese manufacturers are gaining more market share. We identified 55 relevant manufacturers of industrial trucks. The segment of classic IC counterbalance forklifts is dominated by Anhui Heli and Hangcha, which together account for 39.7% of the domestic production of this machine group. Chinese companies with a product program focused on higher added value products, such as electric warehouse equipment, have been focusing primarily on the world market until recently. With its strong development, the domestic market is gaining in importance, however. Furthermore, there is also a rising demand for reach stackers, container handlers, telehandlers and rough terrain forklifts. The 17 foreign manufacturers of industrial trucks in China account for 25% of the total production in this segment. The phenomenal growth during the recent years has attracted new players and investments in production and sales capacity, which led to increased competition among equipment manufacturers. Professional management and profitability have significantly gained in importance and the industry consolidation is moving forward. This development is further accelerated by several governmental initiatives to stimulate M&A-activity. Other means of market adjustment are emission regulations, which force manufacturers with outdated technology out of the market, or – in the area of agricultural machinery – a periodically updated list, which defines exactly, which type of model from which manufacturer is eligible. In all three industries, manufacturers with an already strong market position were able to increase their market shares during the past years due to superior products, aggressive pricing and the establishment of professional sales organizations. A weakness of the Chinese manufacturers of mobile working machines is the lack of indigenous know-how in key technologies such as hydraulic components, powerful engines, electronic control systems and transmissions. The majority of components with high added value are still imported largely from Germany, South Korea or Japan. This not only leads to cost disadvantages, but also threatens the security of supply of domestic manufacturers. Supply shortages of Western component manufacturers led to production losses from Chinese OEMs during the worldwide economic boom 2008, for example. Similar things could be heard from Chinese excavator manufacturers concerning hydraulic key components after the earthquake in Japan in March 2011. To strengthen the domestic base of component suppliers in the areas mentioned above is therefore an explicit goal of the Chinese government in the coming years. In particular in the field of construction machinery, the Chinese government actively promotes the development of environmentally friendly, energy-efficient engine technologies, such as the development of excavators with hybrid drive systems. Firstly, to save resources, which are becoming increasingly scarce with the growing prosperity of 1.3 billion people. Secondly, to develop disruptive technologies, which help to catch up with, or even overtake the established competitors from early-industrialized countries. Due to their promising demographic structures and the corresponding growth potentials, China's machinery manufacturers see their most important markets in the emerging countries of Asia, South America and Africa. Furthermore, the customer needs in these markets are comparable to those in China: In particular a strong demand for low-cost machines, as well as lower requirements for emission and safety regulations. For example, all large construction equipment manufacturers already do have, respectively are building up manufacturing facilities in Brazil or India. Further strategic internationalization approaches are the independent development of production capacities in Europe and the U.S. for greater proximity to key component suppliers (Sany). Moreover, the first Sino-Western takeovers of OEMs and suppliers could be observed (Zoomlion, Liugong, EP). The Chinese acquirers hope to gain better access to the traditional markets and on the technological know-how of their Western competitors, this way. Large infrastructure programs will provide a stable demand for new construction machines through the year 2020. It is expected that the wave of urbanization will continue for at least two decades, with corresponding positive effects on the construction industry, the focus of activities moving away from the coastal areas to the inland. 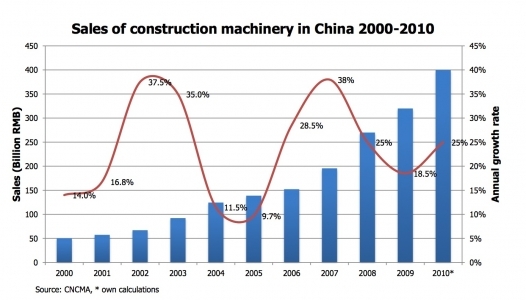 The China Construction Machinery Association CNCMA expects an average annual production growth of 17% by 2015. The major machine manufacturers are more optimistic, which is reflected in plans to increase capacity between 200 and 400% over this period. For the agricultural machinery sector, the Chinese government has formulated mechanization goals, which allow proper conclusions on the future demand for agricultural machines in China. Companies with an already strong position in this segment are expecting a significantly stronger growth than the market due to more competitive products, higher support through purchase subsidies and better export potentials. Depending on the machine segment, we expect an average annual growth between 14 and 28% by 2015. In conventional forklift trucks, we expect a slowdown in growth to an average of 5% per year until 2015, with more complex material handling equipment showing growth rates of between 15 and 17% during this period. Adjusting to a shifting demand for a higher percentage of electric forklift trucks and warehouse vehicles will provide major challenges for a considerable number of domestic manufacturers. The good growth prospects still attract new market entrants. Together with the ambitious expansion plans of established manufacturers, we see a considerable risk of overcapacities in the short to medium term. In addition to strengthening its role as the world's largest market for mobile equipment, however, China will establish itself as a global export base – both for domestic and foreign machinery manufacturers. This trend that can already be observed today. Despite all the difficulties and risks accompanying a stronger involvement in China, OEMs and suppliers must take China into account while developing their strategies more than ever. Considering all the uncertainties in our volatile world, the rise of China seems to be one of the more reliable trends. This is only an overview of our new study "The market for mobile working machines in China". For more detailed information about contents and structure of the study, please visit the following site or call us +49 7621 55 00 440.